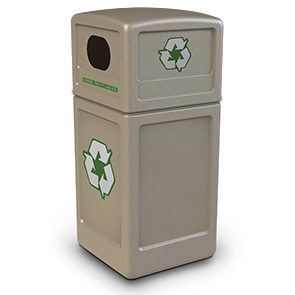 This environmentally friendly recycling receptacle is molded from at least 25% post consumer recycled material. Includes seven decals: Plastic Bottles, Aluminum, Glass, Plastic Bags, Paper, Mixed Recyclables, and Trash, to create a personalized recycling center. Double-Sided opening measures 7-1/2"W x 5"H.
Connecting hardware available upon request to connect two or more units for a complete recycling system. The receptacle has a 42 gallon waste capacity and uses 39 gallon trash bags. Patented Grab Bag™ system holds bag in place, eliminating bag slippage. Extremely durable, perfect for indoor and outdoor use.